When we consider that CNN's own Anderson Cooper was (we assume it is past tense) an employee of the CIA and that the CIA themselves at one time admitted to paying off news networks under their infamous "Operation Mockingbird" program, this story and all that is happening with "fake news" certainly is more food for thought than we can digest in one sitting. When the "swamp" consists of beloved Intelligence agencies with their untold billions in black budgets, draining it might just be easier said than done. -W.E. On Tuesday, January 10, we saw the response. It was obvious, based on what this top Senate Democrat had said, that the CIA used CNN to air unsubstantiated charges against Trump. CNN didn’t delineate the bizarre sexual nature of those charges; that was left to a left-wing “news” organization by the name of BuzzFeed, which posted 35 pages of scurrilous lies and defamation. But the damage had already been done, and Morell knew it. CNN had manufactured a controversy over Trump yet again, demonstrating the truth of Schumer’s statement that the intelligence community would get back at Trump. Trying to pump up the “claims,” Jim Sciutto, Chief National Security Correspondent for CNN, said, “To be clear, this has been an enormous team effort by my colleagues here and others at CNN.” A team effort to verify what? It looks like they were handed a 35-page document from the CIA and decided to publicize it. They failed to reveal the details precisely because they could not verify the document. A Washington political opposition research firm (anonymous) that was hired by clients (anonymous) who were opposed to Donald Trump’s candidacy in both the Republican and Democratic parties. “He [anonymous] began talking to Russian sources [anonymous] from his days in Russia and uncovered this information that’s now being considered by the American intelligence community.” (emphasis added). So one of the Watergate reporters from The Washington Post had put his stamp of approval on the document by saying it was information that had been “uncovered,” rather than being made up. How did he know one way or the other? The answer is he didn’t. 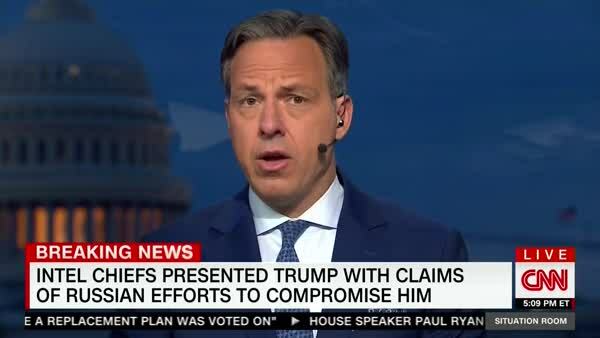 Later, Tapper said the charges were “uncorroborated as of now,” indicating that they might be confirmed by somebody at some time in the future. There was “no proof” of the claims but “confidence by intelligence officials that the Russians are claiming this.” Again, no names were provided. He has “a track record with the United States in coordinating with United States intelligence agencies.” What exactly does this mean? CNN was reporting “news,” since a two-page CIA summary of this dirt was attached to a classified CIA report on Russian hacking and election influence that was given to Trump last Friday, January 6. But it was “fake” in the sense that CNN had no way of knowing if the charges had been completely made up. Since CNN likes anonymous sources, I will use one of my own. “This is a classic CIA blackmail operation where the CIA under Director John Brennan uses someone else’s dirt for the blackmail, and postures themselves as ‘innocent’ in presenting it to Trump,” one observer of the Intelligence Community told me. This is certainly the real story—that an intelligence agency run by Obama’s CIA director would use an American television network to attack the President-elect with scurrilous and unsubstantiated charges. This is how the Intelligence Community, in Schumer’s words, got back at Trump. BuzzFeed is being kept alive by the giant media company Comcast, which recently invested $200 million in the “left-wing blog,” as incoming White House press secretary and Trump communications director Sean Spicer called it.